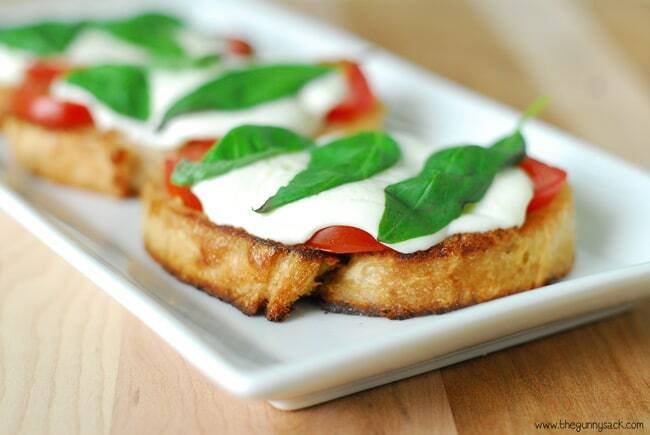 Grilled Margherita Sandwiches are like a margherita pizza in sandwich form. Try making this camping recipe over the fire in a cast iron skillet. When we went camping recently, I didn’t know what to bring to eat. We had what they call “rustic” campsites without electricity. Since we are casual campers, going once every couple of years, our camping equipment is scarce. We had a tent for shelter and a campfire for cooking. I decided to buy a cast iron skillet so that we would have more options for cooking over the fire. And I bought the ingredients to make grilled margherita sandwiches, which ended up being a fantastic idea. 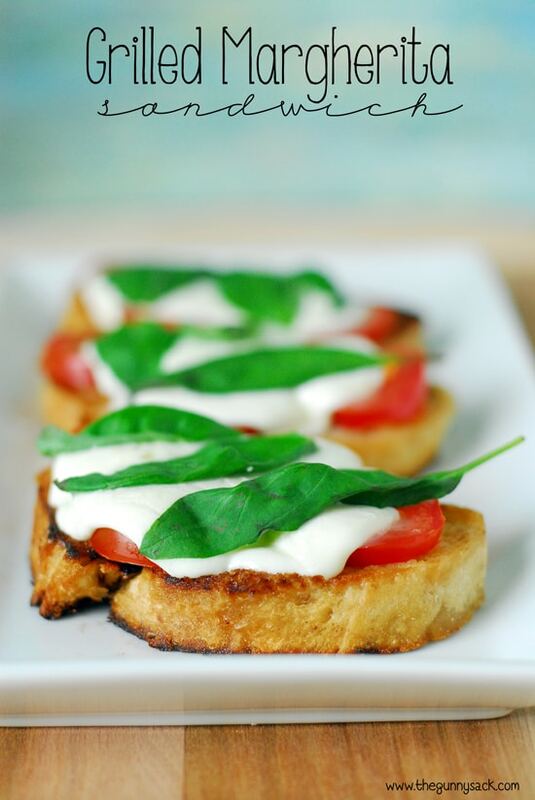 They are like a margherita pizza in sandwich form and they were so delicious that I had to make them again to share with you. The sandwiches are very basic. Start with some fresh Walmart Produce tomatoes. It is very convenient that Walmart has fresh, farmer picked produce with a 100% money back guarantee. There were so many choices of tomatoes at Walmart and they all looked delicious! As I stood in front of them trying to decide which variety to choose, Vanessa and my nieces were shouting out their opinions. “Get those tiny ones!” “Look at those really big ones!” and so on. Finally, I decided on some of the small tomatoes so that they would fit on the slices of bread. I also bought fresh basil, a ball of mozzarella and a loaf of rustic Italian garlic bread. Here are a couple of pictures from camping. They were taken in low light with a phone, but I wanted to show you anyway. The cast iron skillet is on a grate over the fire (next to a coffee percolator) and the skillet is covered with my friend’s small charcoal grill cover to help melt the mozzarella. After my friends saw my sandwich, they had to make one of their own! Cut a loaf of rustic Italian garlic bread into thick slices. Place them in a hot cast iron skillet until golden brown. 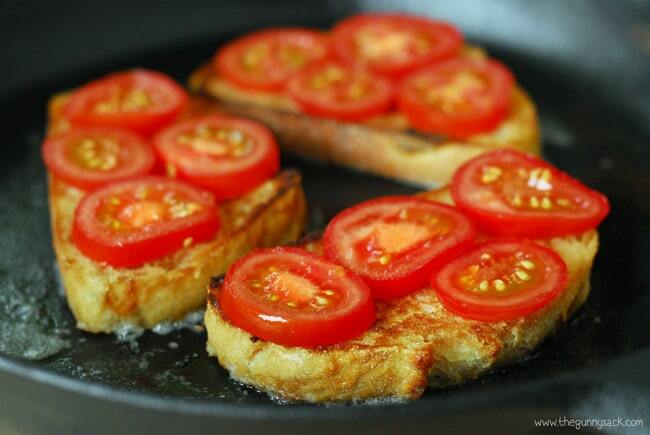 After flipping the slices of bread over to grill the second side, top them with sliced tomatoes. 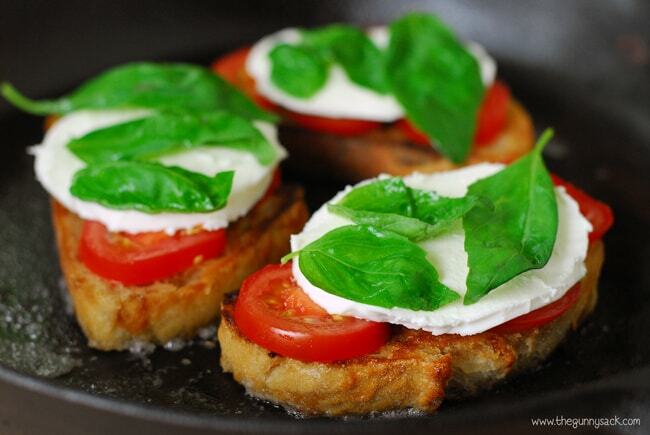 Add slices of fresh mozzarella cheese and fresh basil. Put a lid over the skillet to help melt the cheese. If you are camping and don’t have a lid available, try using aluminum foil. Once the cheese had melted and the bread is toasted, remove from the heat and eat the sandwiches while warm. Please note, that you can also make the sandwiches, at home, in a regular skillet over medium-low heat on your stovetop, which is fabulous since it might be a couple of years before I go camping again and I want to make these Grilled Margherita Sandwiches often! Cut the loaf of rustic garlic bread into thick slices. Butter both sides of the bread and place them in a hot cast iron skillet until golden brown. 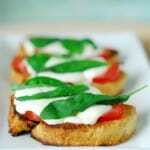 Flip the slices over and top with sliced tomatoes, slices of fresh mozzarella cheese and fresh basil. 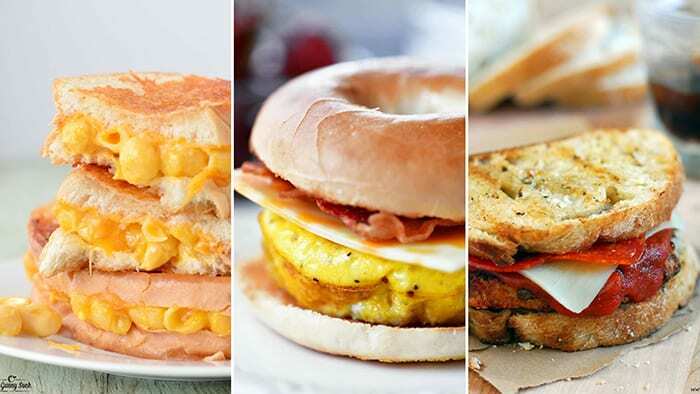 Once the cheese had melted and the bread is toasted, remove from the heat and eat the sandwiches while warm! Please note, that you can also make the sandwiches in a regular skillet over medium-low heat on your stovetop. If this is what camping is then I need to camp with you 🙂 Love the sandwiches!! Anytime! I would love to have you along! I need to camp with you! This is an incredible camping meal, more gourmet than our usual walking tacos! I love this Tonia! Thanks, Tanya! They were so simple yet so delicious! Oh, yeah, I would love to eat this both at home or when out camping! 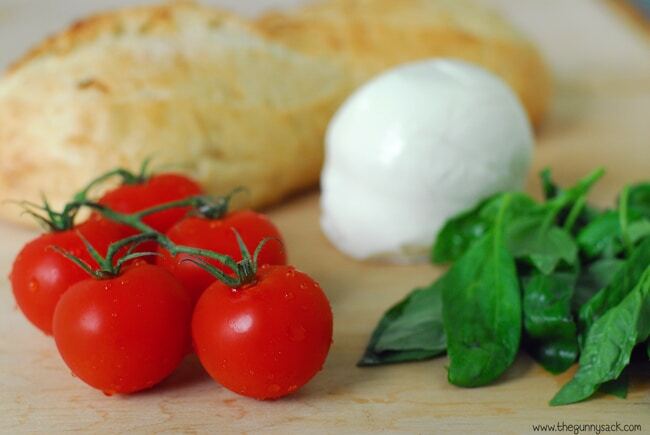 We are huge fans of pizza Margherita here…now I’m wondering why I’ve never made a sandwich version! 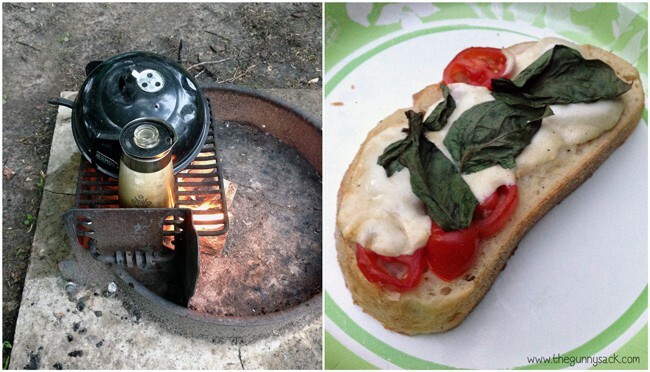 I’ll bet you could even make the pizza version while camping but the bread sounded easier than trying to bring dough. We did something similar when camping too. They’re really great, aren’t they. That’s a great idea because my son would prefer different toppings on his! Thanks, Gav!